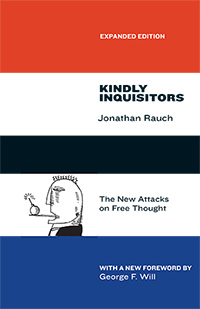 Kindly Inquisitors has challenged readers for more than 20 years with its provocative exploration of the issues surrounding attempts to limit free speech. In it, Rauch argues for the value of “liberal science” and the idea that conflicting views produce knowledge within society. In this expanded edition, a new foreword by George F. Will strikingly shows the book’s continued relevance. Two decades after its initial publication, while some progress has been made, the regulation of hate speech has grown domestically—especially in American universities—and has spread even more internationally, where there is no First Amendment to serve as a meaningful check. But the answer to bias and prejudice, Rauch argues, is pluralism—not purism. Rather than attempting to legislate bias and prejudice out of existence or to drive them underground, we must pit them against one another to foster a more fruitful discussion. Panel from 7 – 8:30 p.m.
Signings from 8:30 – 9:30 p.m.